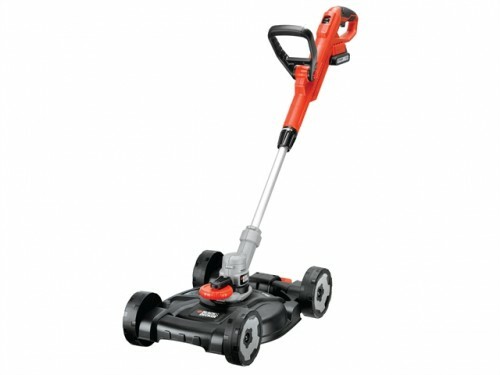 Black & Decker STC1820 18V Strimmer With City Mower is ideal for trimming, edging, and mowing. Powered by E-Drive Technology, that is a high torque gear system powers through even the toughest overgrown areas quickly without clogging. The Click and Go system means you can go from striming to mowing in seconds, as the String Trimmer simply clicks into the base, enabling easy change from trimming to mowing and back. It is lightweight and Portable, so it is easy to carry and use on uneven ground and steep inclines. Easy to store, in a shed, garage or cupboard without using precious floor space. Has adjustable wheels allowing you to easily change the height of cut (40-60mm). It offers cordless convenience with its 18V 2.0Ah Lithium battery technology for long lasting fade free power, without the hassle of a cord. Offers fast cutting, with a 28cm cutting swathe for fast job completion over large areas. Input power: 18 Volts. Battery: 2.0Ah Lithium. Charge time: 5 hours. NL runtime: 44 mins. Swath: 280mm. Line diameter: 1.6mm. Line cutting speed: 5500-7400rpm. Weight: 4.7kg. A weighted sound power dB: 92A. A weighted sound pressure dB: 76A. Hand/arm weighted vibration m/s2: 9.